LOOK AT THE PUPPY! This beautiful Dalmation will light up all the kids faces. 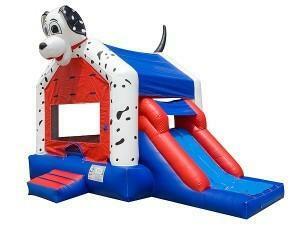 It's friendly design comes with an awesome 13'x15' bouncing area and an amazing slide that exits the unit. Also inside is a rock wall and basketball hoop! RUFF RUFF! GEt all your friends and bounce and jump as high as you can. This unit is great for all ages 1-14 years old. its safe entrance and exit are perfect for the younger crowd.